VOLUM-e acquires the first EOS M400-4 lasers in France. Blangy-sur-Bresle, March 20, 2018 – At the forefront of rapid prototyping and of high quality plastic and metal additive manufacturing, VOLUM-e further expands its machine park and becomes the first French company to acquire an EOS M400-4. With four lasers for unprecedented manufacturing rapidity and increased productivity, the EOS M400-4 will allow VOLUM-e to reduce lead time and increase its production capacity for high-tech parts. 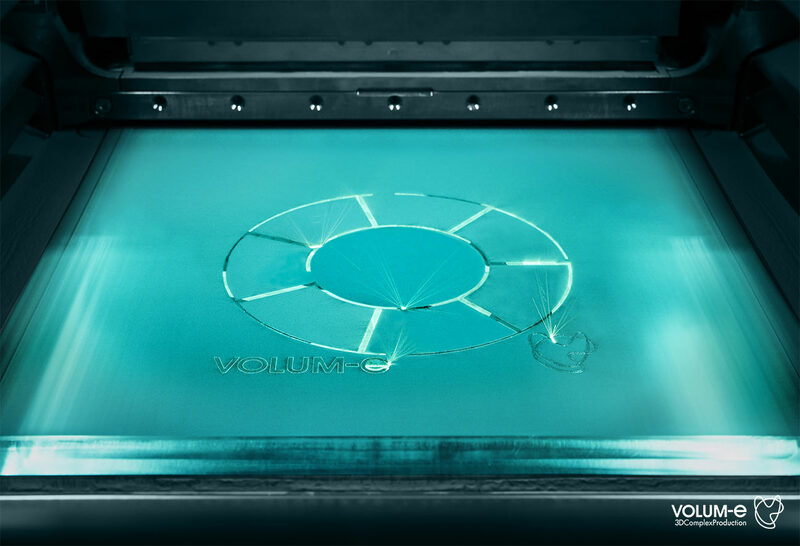 VOLUM-e has one of the largest pools of additive manufacturing machines in France, now reaching 31 systems. In 2014, 11 million euros were invested in building a 1000 m2 shop dedicated to plastic and metal prototyping under the latest safety and technology-specific standards. It hosts several machines from EOS, the world leader in metal additive manufacturing solutions including several: EOS M280 and M290 which maximum manufacturing dimensions are 250x250x325mm, and two EOS M400 which 400x400x360mm, dimensions allow for the industrial production of large metal parts with high precision. VOLUM-e is the first French company to have acquired an EOS M400-4. This improved version of the M400, one of the largest 3D metal printing on the market, is equipped with 4 lasers of 400 watts that operate independently, each on areas of 250x250mm. Its building chamber is also 400x400x360mm. Designed for industrial applications, this new additive manufacturing machine increases process speed while highlighting some other technological advances. Thus, for a part that previously required a month to produce, lead time is now reduced to a week and half. CEO at VOLUM-e, France Desjonquères, comments : “It’s a great pride for us to be first in France to acquire the new EOS M400-4 machine with several lasers, that strengthens our leading position, in particular by our customers in aerospace who face ramp ups and for whom this technological breakthrough if of major interest”. This lead was well acted in March 2015 when VOLUM-e was the first French company to qualify and then produce flying parts through metal additive manufacturing for aerospace primes like ArianeGroup and Safran. French market leader in plastic and metal additive manufacturing, 3DS Group benefits from 40 years of experience in the realization of exceptional parts. Combining creative innovation and exclusive technical skills, the group supplies many industries and guarantees its customers optimal reactivity and adaptability. Located in the Bresle valley, coined Glass Valley for its glass industry’s major role in history and today since it ranks forts worldwide for luxury perfume bottling, the company presents two specialized entities : MMB, that serves the luxury and concept car industries, and VOLUM-e, specialized in aerospace, space and medical devices. Thanks to advanced machinery and unique know-how, 3DS Group can serve its clients at all stages of production on a project : from design to industrialization. With a workforce of 55 people, 3DS Group realized in 2017 a turnover of 6,7 million euros.